Dear Loved Ones, This letter to all my aunts and uncles may come with shocking news, but it happened, and Almighty God worked a victory out of a terrible crime. I feel strongly enough to make this public now, after many, many years of the story being kept secret. How else can God be glorified unless the facts be known by you? 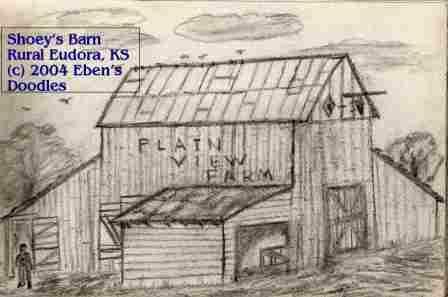 Sometime about 1919, Pearl Shoey, the eldest of the Shoey children, was sexually molested in the barn at Plain View Farm in rural Eudora, Kansas. This atrocious deed was done by a respected friend of her parents, a man who was helping her father build the house, the same one that sets on the property. She had been told to sleep in the barn while the house was under construction, and so she could not avoid the old man. Where could she run? What should she do? In her turmoil and hurt, her first reaction was to shield her parents, for she loved them so much she would do nothing to upset them. Could a little girl be so good? This one was. We know because she kept the crime secret for over eighty years. A couple years ago, many years since her parents deaths, she revealed the incident to two grown daughters in her own kitchen whe n she found she could no longer keep it secret. They comforted her as much as they could, and conversation eventually turned, and the incident was put away, but was it finished? Wounds to the body can heal, but still leave scars that only surgery can remove. Mortal wounds, really bad wounds, to the soul not only leave scars but never really heal. They fester until Christ comes and spreads His own healing Spirit over them. The little girl suffered a violation to her soul that was a great, oozing wound in her being, and she had resolved to tell no one for her parents sake! Imagine that! To keep the terrible secret for eighty years! What did it cost her to do that? Something that festered and bled, day after day, for the space of a long lifetime! Oh, she sang hymns in church of Christ s healing balm--O Balm of Gilead, and others--but they did not reach to her. She prayed countless prayers for the healing of other people's sicknesses and her family's illnesses, but never was a prayer answered for her own great hurt! Yet she did not become resentful, blame God, and become so embittered that she destroyed her own life and those she could influence around her. She loved Christ in the cross she carried, and carried it gladly, becoming gradually and increasingly the gentle, saintly, loving, caring mother, grandmother, and then great-grandmother we see today. But at what cost? We can never know the whole cost, for God only knows, but here is what two of her sons have observed. But finally the grand sum, a jewel that Christ will not turn back at the Gates of Heaven, which themselves are said by the Apostle John in Revelation to be of solid, flawless, perfect pearl. I will close with this prayer from my heart. God Almighty, God of Infinite Mercy and Kindness! To know You is to love You! As Thunderer in the Mountains, Chief Joseph, prayed: Expose our hearts now to themselves, and become their healing remedy, whether to save those who are yet unsaved, or to mend and restore those that have been badly damaged for one cause or another in past life. We ask absolutely astounding miracles to be done in the lives of those reading this, that hearts may be broken if need be, mended if need be, and restored if need be. For the glory of Your saving name and power, Yeshua the Lord, we ask this. Amen --Tom Bigelow. Of all the jewels of heaven, surely the one closest to a human tear was the pearl. It was literally formed by tears the tears of a hum an soul turned to a jewel-forming nacre. For some divine reason, the Lord of all held human tears most precious. He did not let one tear drop by a godly person and be wasted, for it was gathered up by His angels and carried to heaven and put in God's bottles. These ewers were not glass but purest gold, covered with jewels, but the true jewels were inside the containers, turned to pearls. As the tears increased inside each saint's ewer, it was enlarged. Some remained small, but no less precious than the larger ones. A child's tears, shed in a brief lifetime of woe, was just as treasured by God as the many, many tears shed over a long lifetime by a suffering saint. When the saint had wept his or her last tears appointed by God the saint was called home and the ewer was given to that soul as one of the Lord's eternal rewards. It was proof forever that the redeemed soul had suffered for the Lord's sake, since, except for the pierced hands and feet of the Savior, there remained in heaven no signs of sorrow or sin after life on earth was over. Only one saint was rewarded a special reward than the ewer itself. She was a farmer's daughter, and she suffered eighty years, carrying a wound inside her heart carrying it, not for herself, but for her beloved parents' sake until her death. Pearl Shoey-Bigelow found herself wearing a beautiful, white, shining robe as she rose up from her bed and was met by angels and loved ones at death s door. She expected that she would be led to paradise, but instead she was flown swiftly to the Cavern of Orion, where a celestial project was in progress. Afterwards, when the project was completed, she was taken to heaven. Escorted like the highest royalty, Pearl was amazed by everything how she was led along down a great, spread ing avenue toward a far green line. When they drew closer, the line expanded into a paradise of forests, valleys, mountains, and flowers, flowers everywhere! Choirs started up on every side of the lane down which she was drawn hundreds, thousands of people, all singing their welcome! as she wondered who they could be making such a big fuss about. She was brought to a crystalline river. Gently, she was led into the sparkle-filled, dazzling clear water. She was surprised when it flowed up over her head, but she could sti ll breathe perfectly. She felt no fear whatsoever, for her loved ones all assured her with their loving presence. Her Ma, her Pa, her brother Artie, and how wonderful her Bob too! They were all so young looking but she recognized every one! The only strange thing was how they treated her like some kind of queen! Why? She wondered. What was making them act like that? She was just the same Pearl, wasn't she? The walk through the crystal river was wonderful. It felt so invigorating--all joyfulness and peace and purity there was an indescribable feeling of absolute purity that remained with her as she climbed slowly out on the opposite, flowery bank. She wanted to just stop there and look around at the glorious beauty of the place, with its willows dipping their leaves in the river, and groups of children busily running in the tall flowers and grass, and other groups, mostly adults, sitting and listening most attentively to someone who seemed to be there but was invisible. Despite her wish to remain, her family led her onward toward what she could see were golden towers shining on the edge of tall, white and violet mountains. The Master wants you! she was informed by a herald in a shining, white robe with a golden sash. "Yes, Lord!" she said. In a moment, she no longer wanted to tarry, however sweet the scenes. She wanted to see Jesus. After all, heaven was only heaven because of Jesus, who had redeemed her with His precious blood shed on Mount Calvary. Her pace quickened, as her expectation grew. At last, after so many years of earth, she was going to see the Savior! She would look into His glorious face for the first time! There was nothing to prevent her, she knew! She had loved Him with all her heart, all her days since the hour she had first felt the light and release of His saving grace, that time she sat on her Ma's knee. How could she forget? Never! Her mother taught them, home school style, before they were old enough for the school house. What did she teach? With her Ma reading the Bible, the stories of the saints, the life of Christ she absorbed them first from her Ma, sometimes with the help of a child's pictured book. It was at such a time when she realized she was a sinner, and she told her Ma. Her Ma then assured her that if she confessed her sin, the Lord would forgive her and make her His child forever. Yes, Ma, I want Jesus to do that! she said. Then her Ma said, "Just say so, child, and ask Him into your heart. That's all you need do, and He'll take care of the rest." It was so! The Lord Jesus had entered her heart, and she became His daughter forever from that day on. Oh, the troubles came, and even tribulations. But though the pain was great at times, the joy proved greater greater. Now she was in glory, about to see Jesus, who had made salvation possible for her! What more could she want? Pearl hurried ahead of her welcomers and reached the city she had seen from afar. She wasn't the least bit tired from her journey. Her body was full of wonderful light and energy after the refreshing bath in the river. But how surprised when she found what looked like the entire city turned out to greet somebody very important. Who could the person be? She looked around, behind her, and to the side, but everyone was waving at her and singing greetings in every kind of language it didn't matter what language somehow she could translate it in her mind, she found. Astounded, she finally stood and waited for someone to explain what was happening. But where was the Lord Jesus? Just as she thought it, a light appeared more dazzling than the city's walls and towers and moved down toward them. Now Pearl was feeling most bewildered as she saw literally millions, actually uncountable numbers of white-robed saints pouring out from the city from every gate, and all were making their way toward the place where she stood. As the light in the sky came closer, the jewel-like blue seemed to roll back and indescribable colors and singing burst forth. In the midst of the ever-increasing glory was the single figure of a man, a Jewish-looking man in a prayer shawl. Jesus? She marveled. It had to be Jesus! She sank to her knees. All around her the multitudes sank to their knees as they sang and shouted toward the approaching Lord of all. Wave on wave of light shone down on her, and yet Jesus was brighter still and made all glory surrounding him seem dim in comparison. Pearl felt almost faint, and she would have fainted but a hand reached out and caught her. When she looked, she gazed with surprise into the clearest, most beautiful eyes the Universe had ever seen and would ever see. There was no question in her mind Whose hand it was and Whose eyes they could be. She wanted with all her heart to fall at the Lord's nail-pierced feet and worship Him, but He took her hand and led her. "Come and I will show you something, beloved!" She wept as He led her through the crowds up the golden lane to the main gate of the Celestial City. Glory upon glory was there in the jewels of the foundations, in the splendor of the golden walls, in the banners, in the angelic guards with their might and splendor but it was none of these that He wished to show her. "Look!" he said, pointing. She followed his finger and saw that the City of the Great King was lacking a gate! "How can this be?" she burst out, astonished. No gate? "I have been waiting for you," the Lord said, smiling. We've been waiting a long time! What could the Lord mean? Pearl wondered. She dared not ask. Yet her thoughts flew to Him, and His thoughts flew to her, without any barriers whatsoever. As if in answer to her question, she saw the Lord signal to an angel who stood at the doorless gate. He strode off, going into the city. A moment later He reappeared, carrying a huge, jewel-encrusted golden vessel. At the sight of it people all around were astonished and fell down, praising the Lord. "What is it?" she cried, unable to hold back. Meanwhile, other angels, by the hundreds, carried out vast golden frames for a gate and laid them down. At the Lord's command, the huge vessel was brought to Pearl. "These are your many tears, shed for Me," he explained gently to her, with tears in His eyes. Pearl's heart almost turned over. She could not comprehend the Lord's meaning at all. "Have I shed so many tears for You, Lord? There must be some mistake. When did I shed so many tears for you, that they could fill so great a jug? People always said I was so happy all the time, they never saw me cry, even when my Bob was killed in a plane crash." Her Lord came close, whispering something to her ears only. Pearl slowly nodded when He had finished. Her face then took on a radiance that even the angels had trouble looking upon. Jesus put His arm around Pearl, as they stood together watching the angels pour the costly tears, turned into more precious pearls, out upon the golden frames for the door. Pearl could hardly take it all in, the great value that the Lord Himself upon her suffering. and was thrilled, comforted at the same time, when the pearls all merged into one vast pearl, completely covering the space within the golden frame. When the door was complete, it was lifted up and set on the hinges. But one half was missing. How could that be? "We are waiting a bit longer for the other half to come and be built," Jesus explained to Pearl. "A follower of Mine, whom you do not know but soon will know, has the number of tears required to finish My city's Gates. He is fighting for Me, in a battle for the bridge that unites all men, but when he is finished he will be brought here and the remaining portion built as yours was to make a complete gate here among the three on the Western side for My beloved City."